The Farmers' Rights Project focused on farmers' rights related to plant genetic resources for food and agriculture, as they are recognised in the International Treaty on Plant Genetic Resources for Food and Agriculture (ITPGRFA). There was substantial uncertainty as to how the provisions on farmers' rights under the International Treaty can be implemented and what the role of the Governing Body of the Treaty should be in this regard. 1) To provide an overview over, and assessment of, options available for the domestic implementation of farmers' rights under different conditions. 2) To identify potential ways and means for the Governing Body of ITPGRFA to promote the realisation of farmers' rights. 3) To contribute to the understanding of the options available for the implementation of farmers' rights under ITPGRFA among its Parties and stakeholders. Survey on the history of Farmers’ Rights, based on a document and literature review. International multi-stakeholder questionnaire survey on Farmers’ Rights. Case studies on Farmers’ Rights in India, Peru, Ethiopia and Norway. 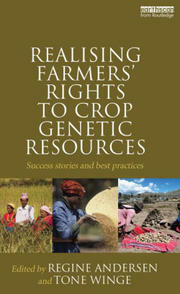 Documenting Success Stories from the Realization of Farmers' Rights. The Lusaka informal international consultation process on Farmers' Rights (together with the governments of Zambia and Norway). Workshop Module on Farmers' Rights. Various workshops and consultancies on the realization of Farmers’ Rights. Research on civil society strategies for the implementation of Farmers' Rights. The 2010 Global Consultations on Farmers’ Rights. Various side events and lectures on Farmers' Rights. The intention of the project was to move ahead from earlier controversies, and – based on the consensus formulations in the Treaty – build bridges to a joint perception of needed action, in respect of the countries' freedom to choose measures according to their needs and priorities. Abingdon (UK), Routledge, 2017, 232 p.
Aldershot, Ashgate, 2008, 420 p.
Abingdon (UK), Routledge, 2013, 232 p.
FNI Report 17/2012. Lysaker, FNI, 2012, 119 p.
FNI Report 11/2011. Lysaker, FNI, 2011, 116 p. In Norwegian. FNI Report 2/2011. Lysaker, FNI, 2011, 161 p.
FNI Report 1/2011. Lysaker, FNI, 2011, 131 p.
FNI Report 3/2009. Lysaker, FNI, 2009, 63 p. In Spanish. FNI Report 16/2008. Lysaker, FNI, 2008, 57 p.
FNI Report 4/2008. Lysaker, FNI, 2008, 72 p.
FNI Report 11/2006. Lysaker, FNI, 2006, 13 p.
FNI Report 7/2006. Lysaker, FNI, 2006, 64 p.
FNI Report 6/2006. Lysaker, FNI, 2006, 52 p.
FNI Report 5/2006. Lysaker, FNI, 2006, 109 p.
FNI Report 9/2005. Lysaker, FNI, 2005, 117 p.
FNI Report 8/2005. Lysaker, FNI, 2005, 50 p.
El Confidencial, 20.2.2019. In Spanish.